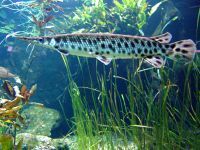 Spotted gar prefer shallow open waters, usually 3 - 5 m deep, as well as stagnant backwater in North America. They are often found near the surface basking near fallen logs, trees, or brush. This species is also shoreline-oriented, meaning it can be found near banks that include some sort of brush covering. Spotted gar are rarely found in areas that do not include some form of brush covering. Females are generally larger than males, probably due to their reproductive investment. One study reported the mean standard length of a male to be 43.2cm (17") and that of the female to be 48.6cm (19.1"). Despite its fearsome reputation, this is actually quite a timid fish. While it won’t hesitate to munch any smaller tank mates, it can be kept alongside other big, peaceful species in suitable surroundings. Very active, aggressive or boisterous species should be avoided. It’s equally mellow with members of its own species and can usually be kept in a group provided all the fish are of a similar size. It can sometimes be tricky to get newly-purchased fish to accept dead foods. Most will learn to do following a short period of starvation. If your fish is refusing to accept frozen foods, refrain from feeding for a few days then try again. After a short time you should find the fish will eat most meaty frozen foods such as prawns, lance fish etc. Larger specimens can be fed whole white fish, such as trout or sprats. Feed every day when juvenile but as the fish grows reduce the frequency. An adult specimen needs only one or two meals per week at most. However if your gar is very thin when you buy it and is also refusing dead foods, there may be no other option but to feed it up using live “feeder” fish. This is only advisable until it’s built up enough body mass to attempt a starvation period. It’s best to buy the feeders in advance and quarantine them for at least two weeks to ensure they’re free of disease. During this period, feed them a high quality diet so that they’re enriched with beneficial nutrients when you feed them to the gar. As with most fish, this species should not be fed the meat of mammals such as beef heart or chicken. Some of the lipids contained in these meats cannot be properly metabolised by the fish, and can cause excess deposits of fat and even organ degeneration. Except for in the extreme circumstance described, there’s also no real benefit in the use of “feeder” fish such as livebearers or small goldfish. Risks involved with feeding these include the potential of disease introduction. Juveniles, once or twice a day. Adults at least 2-3 meals a week. It’s predominantly a surface-dwelling fish and is unfussy regarding decor. However, a dimly-lit tank with some big pieces of bogwood and perhaps some beech branches would look very effective, as well as mimicking many of its natural habitats. Choice of substrate is down to personal preference. Some hobbyists prefer to leave it out altogether in order to make cleaning the tank an easier task. A heavy, tightly-fitting cover is necessary though, as gars do jump occasionally. Leave a gap of a few inches between the cover and water surface to allow the gar access to atmospheric air. It inhabits still areas in nature, and any water movement is best kept to a minimum. However, a large and efficient biological filter is needed to cope with the amounts of waste produced by a predatory fish of this size. If possible, choose a sump-type arrangement, as this allows most of the equipment to be located outside the tank and will make maintenance much simpler. Gars aren’t very flexible fish and a very wide tank is needed to give them space to swim properly. This is down to the structure of their bony ganoid scales, an archaic feature shared only by the similarly ancient Polypterids (bichirs). For a medium-sized gar like this a tank of around 10′ x 5′ x 3′ (300cm x 150cm x 90cm) – 4050 litres would be just about acceptable. A very large and aggressive species. Be careful choosing tank mates as this fish will consider any fish that is smaller than itself as food. It is not too aggressive towards fish its same size but it will bully any fish that is smaller. An elongate slender fish with a long pointed snout and dorsal fin set way back towards the rounded caudal fin. The flanks and fins of this fish have large brown spots on a silver base colour. This species of gar rarely exceeds 91cm (35.8"), and the average length is 76cm (29.9"). Its body is cylindrical and often mistaken for a log lying in shallow waters. This gar is covered with hard, diamond-shaped ganoid scales. Their bodies are spotted, including the top of the head and the fins. Lepisosteus oculatus is often mistaken for the Florida gar, Lepisosteus platyrhincus; the two can be distinguished by the distance from the eye to the gill cover. In the spotted gar, this distance is greater than two-thirds the snout length, while this distance in the Florida gar is less than two-thirds.